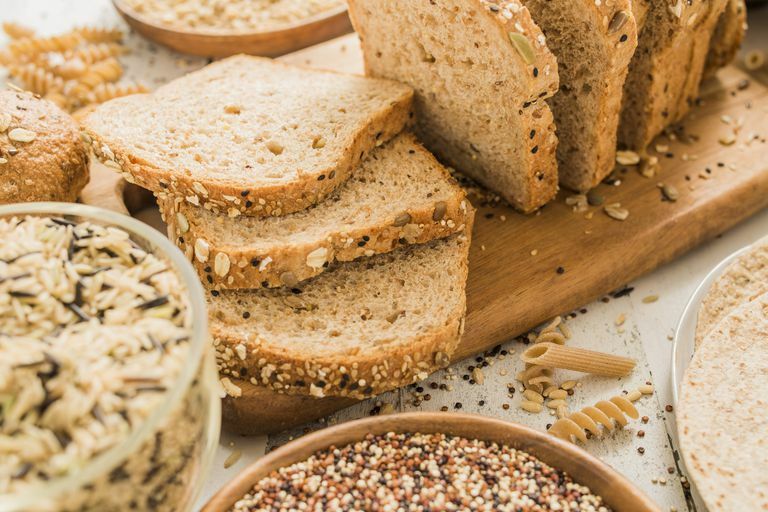 Whole grains, rather than refined grains, give you the total benefit of many natural plant compounds that may lower your risk of developing cancer. If you balance your diet with whole grains, fruits, cruciferous vegetables, and limited portions of red meat, you can lose weight and reduce your risk of cancer. Throw in a regular exercise routine, and you're boosting your overall health while protecting your bone density. Take a look at whole grains and how they can benefit you. Whole grains use all three parts of the grain kernel: germ, bran, and endosperm. Refined grains are missing their germ and bran layers, because they have been milled, leaving only the endosperm—the starchy carbohydrate inside the bran husk. The bran is the outer protective layer of the grain kernels, and it has fiber, antioxidants, and B vitamins. The germ is the smallest part of each kernel, loaded with B vitamins, healthy fats, minerals, and a bit of protein. One easy way to visualize the difference between whole and refined grains is to look at brown rice and white rice. Before milling, these grains were both brown, containing all three layers of the natural kernel. After milling, the white rice, while it may look nicer and cook faster, is missing the most beneficial layers of the grain's kernel. Whole grains are fully loaded with many plant compounds that can protect your cells from the kind of damage that may lead to the development of cancer. Enriched refined grains may have these benefits mixed back into the finished food product, but fiber is not always part of that enrichment—so read your food labels carefully. Whole grains have many natural compounds that have been shown to lower your cancer risk, and these are dietary fiber, antioxidants, phenols, lignans, and saponins. Dietary Fiber: Whole grains are a good source of dietary fiber, that helps reduce constipation and other digestive problems, while helping you feel satisfied after a meal, and avoid overeating. Antioxidants: These are compounds that prevent or minimize cell oxidative damage caused by free radicals. Antioxidants can help promote good health for your heart, brain, and eyes, by slowing the natural aging process. By cleaning up free radicals in the body, they also keep these unstable molecules from damaging DNA (causing mutations), the forerunner of cancer. Phenols: These are aromatic compounds that occur in essential oils. The benefits start with the great fragrance, but phenols also have powerful antiseptic and antibacterial properties. These fragrant compounds can act as stimulants for your nervous and immune systems. Lignans: Whole grains are a good source of lignans, a plant-based estrogen. Lignans may act similar to weak estrogens, sliding into estrogen receptors on cells in breast and endometrial tissues. This action may protect cells that could become damaged or cancerous when in contact with female estrogens. Saponins: These are water and fat-soluble plant compounds that function as natural antibiotics. Saponins can help lower your cholesterol, fight infections, and may help your body protect itself from cancer. It's easy to add whole grains and their health benefits to your daily diet. Leave white bread on the shelf, and select whole grain breads instead. Skip the white rice and enjoy slow-simmered brown rice instead. Make a good-sized batch of brown rice, and save time by reheating leftover portions in your microwave or steamer. When making soup, add brown rice, wild rice, or barley to enhance its flavor and fiber value. If you like salads, try tabouli, which uses bulgur wheat, a tasty and filling whole grain. Try having whole-grain cereals at breakfast, or a bowl of hot-rolled oatmeal, instead of sugar-loaded corn flakes. And there's always popcorn, an entertaining whole grain that can be fun to cook as well as to eat. From amaranth to buckwheat, check out these other fun ideas for adding more whole grains to your diet. In the table below, you'll see a list of whole and refined grains and products. This is not a complete list, but may help you get some idea of what to look for at the grocery store when you are shopping for grain products. Remember to read food labels carefully, and distinguish between such phrases as "whole wheat" and "whole grain." Below is a table comparing whole grains to refined grains as you consider the foods you eat each day. Choosing whole grains over refined grains is an excellent way to add an anti-cancer punch to your diet. Not only do whole grains reduce your risk of heart disease, but a 2017 study found that consumption of whole grains is inversely related to both cancer mortality and overall mortality. It's not just your health, however, and many people find that, after switching to whole grains, they enjoy the foods they are eating much more. If you don't enjoy one type of whole grains, keep in mind that there are many options. Have fun with trying out foods you've never had while you substitute healthier choices for those you often eat. American Institute for Cancer Research. Foods That Fight Cancer. Whole Grains. Chen, G., Tong, X., Xu, J., Han, S., Wan, Z., Qin, J., and L. Qin. Whole-Grain Intake and Total, Cardiovascular, and Cancer Mortality: A Systematic Review and Meta-Analysis of Prospective Studies. American Journal of Clinical Nutrition. 2016. 104(1):164-72. Zhang, B., Zhao, Q., Guo, W., Bao, W., and X. Wang. Association of Whole Grain Intake with All-Cause Cardiovascular, and Cancer Mortality: A Systematic Review and Dose-Response Meta-Analysis From Prospective Cohort Studies. European Journal of Clinical Nutrition. 2017 Nov 1. (Epub ahead of print). USDA MyPyramid.gov. Inside the Pyramid - Grains.